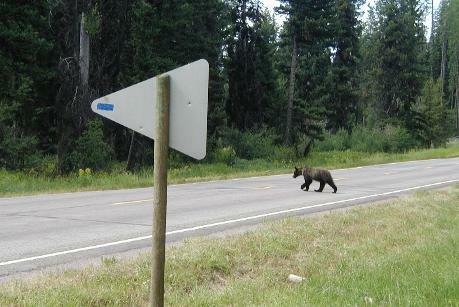 Ecostudies has worked with the Oregon Department of Transportation (ODOT) to identify important wildlife-crossing areas along the state’s network of roads and highways. Our most recent effort was the Interstate 84 Wildlife Crossing Study. In this project, we mapped the spatial distribution of animal carcasses along a 44-mi length of Interstate 84 that passes through the Columbia River Gorge National Scenic Area in western Oregon. A previous study by Ecostudies scientist John Lloyd had identified portions of this area as potential hot spots for collisions between wildlife and motor vehicles. The results of our research have allowed planners from ODOT and other state and Federal agencies to identify areas where collisions are clustered into discrete hot spots, in turn allowing for the targeted and efficient use of mitigation measures, such as increased signage, wildlife overpasses. Raccoon (Procyon lotor) and black-tailed deer (Odocoileus hemionus columbianus) were the most frequently encountered species (54 and 50 carcasses, respectively). Other infrequently encountered but notable species included in our sample of carcasses were black bear (Ursus americanus), bobcat (Lynx rufus), and river otter (Lutra canadensis). Across all species, collisions peaked in April and declined steadily throughout the remainder of the year. Seasonal variation in the frequency of collisions with black-tailed deer was negligible, except for a moderate spike during October. The spatial distribution of carcasses was not random. We found evidence of clustering among all carcasses recovered, among carcasses of black-tailed deer, and among carcasses of raccoon. We identified two hot spots for black-tailed deer, one between mileposts 35.6 and 43.4 and the other between mileposts 55.7 and 59.7. Fifty-two percent of the black-tailed deer carcasses were recovered within these two hot spots, which accounted for only 27% of the total highway miles in the study area. We also identified a single hot spot for raccoons, located between mileposts 20.1 and 29.5. Twenty-six percent of the raccoon carcasses were found within this hot spot.